A movement for organized athletics at Catholic University began soon after the admission of undergraduate students in 1904. A faculty committee on athletics appointed in 1905 began to sponsor annual athletic balls and to lobby for University support of athletics as a means to satisfy the students already enrolled and to attract others. As early as 1906 students wanted a baseball team that was equipped at the expense of the University and permitted to play intercollegiate games. Some faculty and members of the administration opposed university-sponsored athletic teams because of their expense to the institution and time lost to study. Within a few years, however, the baseball team was performing well against local competition and the University board approved the use of a temporary gymnasium to allow basketball practice as well. In 1912 the athletic council was asked to assess the projected financial costs of retaining the football team. 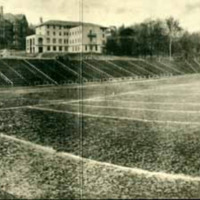 By 1914 athletic fees were charged to students and a director of athletics was appointed. The construction of a gymnasium in 1919 helped support the still hotly-debated athletic program. 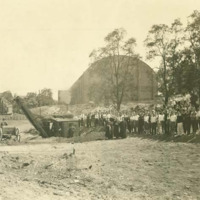 With the promise of funding from the Lay Alumni Association, construction of an athletic field and stadium planned by engineering professor Louis H. Crook, was begun in 1924. When the alumni were unable to meet the cost of draining and leveling the field, the board and rector approved the allocation of University funds to allow the completion of the stadium, considering that it would become a financial asset. The new stadium was dedicated October 4, 1924, in a ceremony that included Secretary of the Navy Curtis N. Wilbur and Major General John A. Lejeune, commandant of the United States Marine Corps, as well as many other prominent guests. An audience of ten thousand attended the dedication in spite of the opening of the World Series in Washington on the same day. 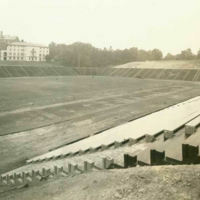 The stadium, situated at the rear of the gymnasium was 440 feet long and 280 feet wide with a seating capacity of 25,000 and standing room for 10,000. Built of reinforced concrete, it was constructed in a U shape to allow for enlargements to a final capacity of 60,000. 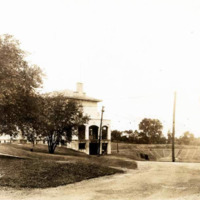 It included facilities for football, baseball and track as well as parking for 300 automobiles. 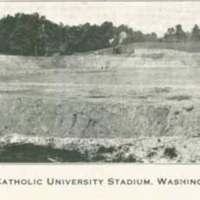 It was hoped that the stadium would help make Washington a national athletic center.